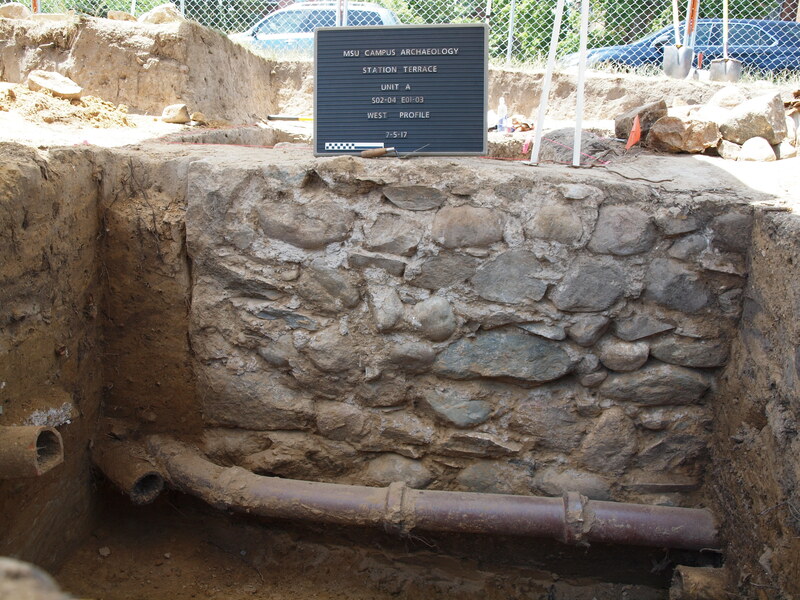 Stone foundation wall uncovered by 2016 survey. The 2017 Campus Archaeology field school is done! This year the field school ran from May 30th – June 30th. The goal for this field school was to excavate at the site of Station Terrace. CAP surveyed this area in 2016 ahead of the Abbot Entrance rejuvenation project. One of our test pits uncovered a stone foundation, so we opened up a 2 meter x 2 meter test unit to investigate further. The stone wall started almost 1 meter below the ground surface, and terminated just over 2 meters below ground surface. The east side of the wall was filled with large boulders, but had a cement floor (including a pair of men’s shoes! ), leading us to believe that this was likely the interior of the building. 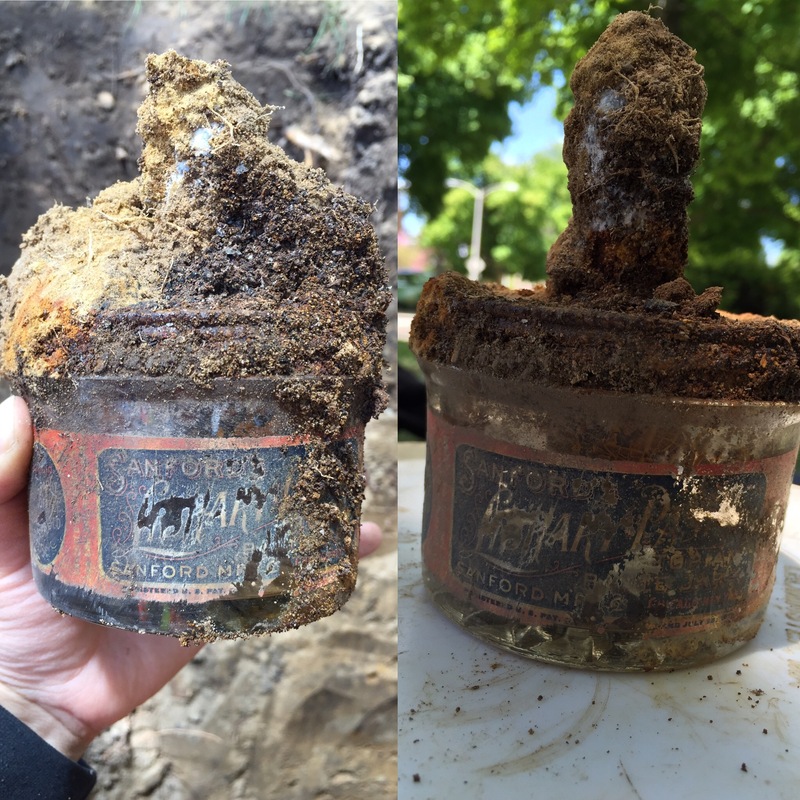 The west side of the wall contained a large area of burnt material and cultural debris – including the complete Sanford library paste jar. There were also two large ceramic pipes running along the bottom of the foundation wall. Even with extensive research there was still many things we still didn’t know about Station Terrace. We don’t know the exact construction date (it’s sometime between 1890-1895), no blue prints have been found, and although we know generally what the building was used for (extension faculty housing, bachelor faculty housing, East Lansing post office, trolley waiting room, Flower Pot tea room) the details remained elusive. So, it was decided that the 2017 field school would excavate more of Station Terrace. Thankfully IPF was incredibly helpful this year, and had a backhoe remove the first 2 1/2 – 3 feet of overburden and dig OSHA compliant terracing around the site. We had a small group of students this year but much was accomplished. 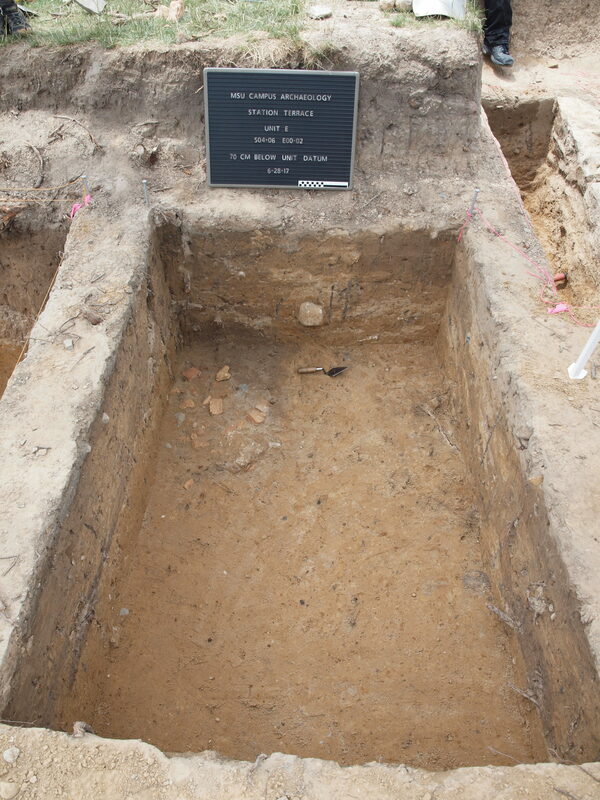 A total of six units were excavated. Unit A was placed with the unit’s west wall along the building foundation. This unit also slightly overlapped with the 2016 test pit in the northwest corner. 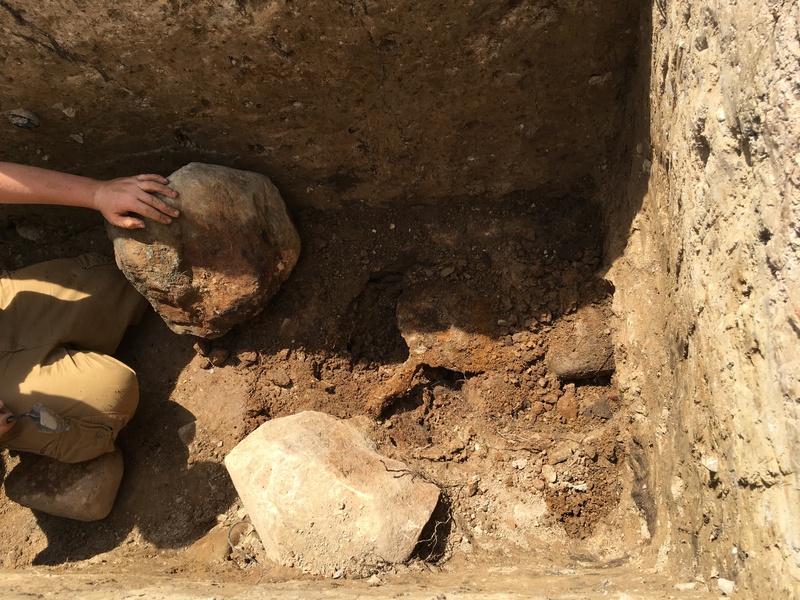 In addition to more of the foundation wall (including a corner), a concentration of large boulder debris, Kaleigh and Josh uncovered the ceramic pipes along the foundation base, and hit more of the burn feature. 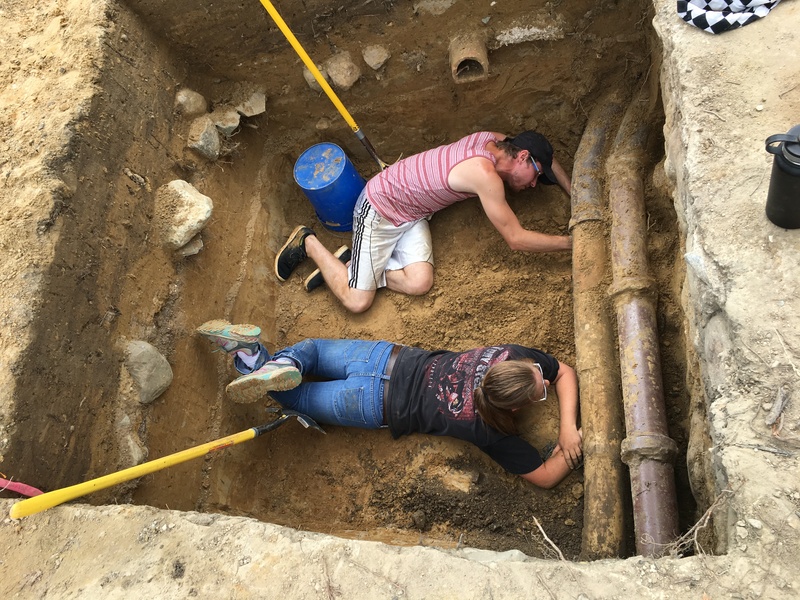 Josh Eads and Kaleigh Perry work to excavate under the large ceramic pipes located along the foundation wall in Unit A. Unit A West Wall – showing foundation wall, builders trench, and ceramic pipes. Unit A North Wall – Amazing stratigraphy showing prior unit, burn feature, and fill. 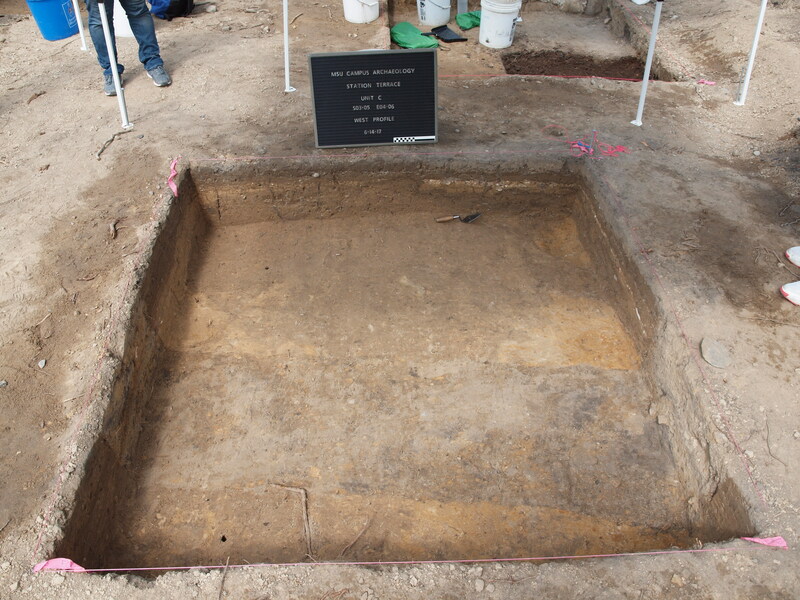 Unit B was placed at the southern end of the field school excavation area. 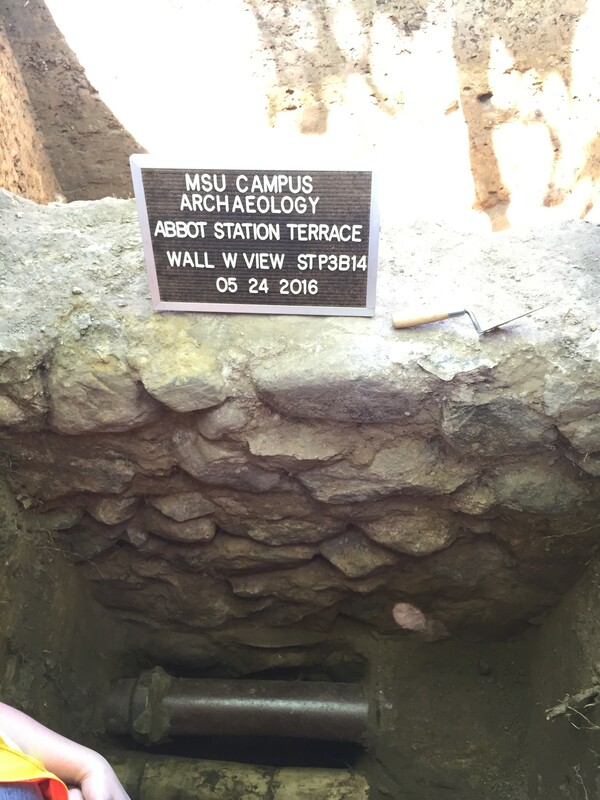 Though this unit did not hit any structural portion of the building, they had a dense layer of nails directly below a layer of clay, a brick concentration along the northern wall, and a large cement pad along the south wall. The cement pad will require further research, but it’s possible that it is associated with the trolley. Unit B south wall – large cement pad. Unit B west wall – brick concentration and gravel layer. 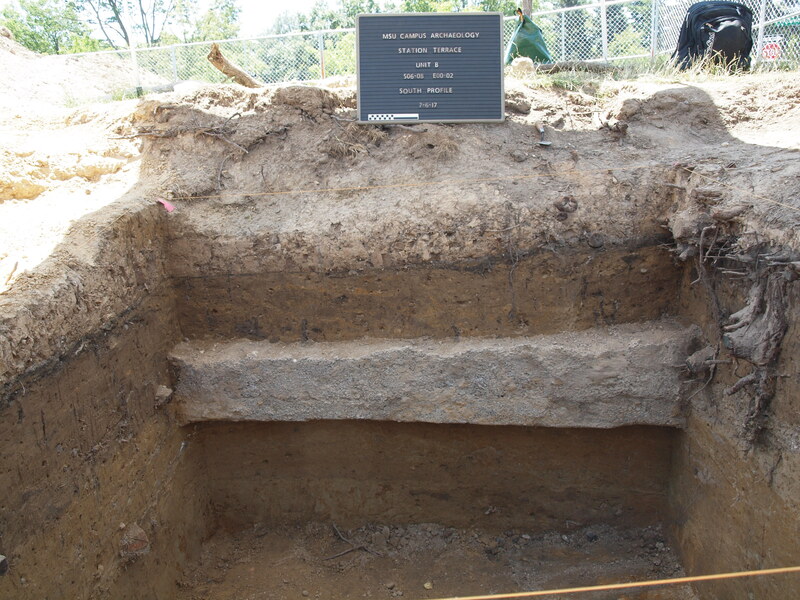 Unit C was placed near the eastern limit of the field school excavation. 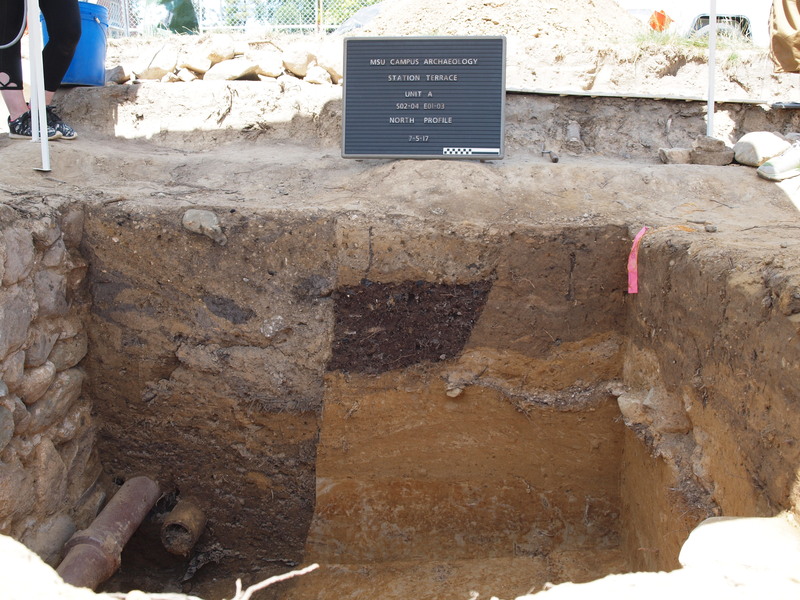 This unit was closed early as it became apparent that a modern trench transected most of the unit, and there were very limited amounts of artifacts. Unit C floor – modern trench disturbance visible. Unit D was opened after Unit C was closed. This required the manual removal of the extra over burden as the excavations in Unit’s A and B allowed us to target the interior of the building, as well as follow the corner of the wall in Unit A. 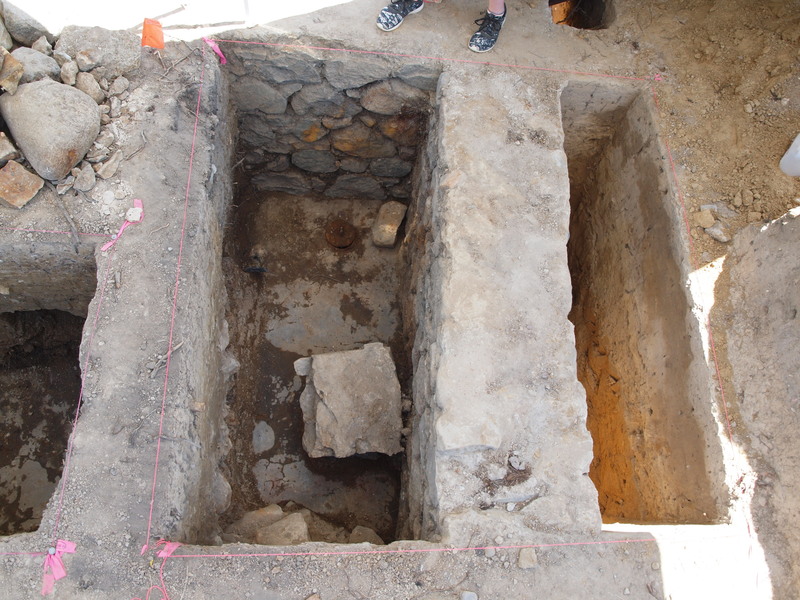 Unit D, excavated mainly by Jerica and Alex, had the foundation wall bisect the unit. The south side of the wall is likely a builders trench full of mostly sterile sand. The north side of the wall had many large boulders (likely wall fall from the building being moved). This side also had the cement floor and more intact artifacts closer to this floor; a complete Curtice Brothers ketchup bottle and part of a rubber boot were recovered. There was also a capped drain through the cement floor. Unit D during excavation. Stone foundation wall and boulder fill. Unit D after excavation. The cement floor, foundation wall, and builders trench pictured. Unit E was opened between Unit D and B to determine if any further structural components of the building were present. Unit E did hit the brick concentration found in Unit B, but artifacts were sparse so the unit was closed to concentrate on our units. Unit E – brick concentration in upper left corner. Unit F, a 1×2 meter unit, was opened directly north of Unit D in order to investigate more of the building interior. Unfortunately due to spacial restrictions from the road and newly planted trees limited areas additional units could be placed. Similar to the northern portion of Unit D, Unit F encountered several large boulders and the cement floor. 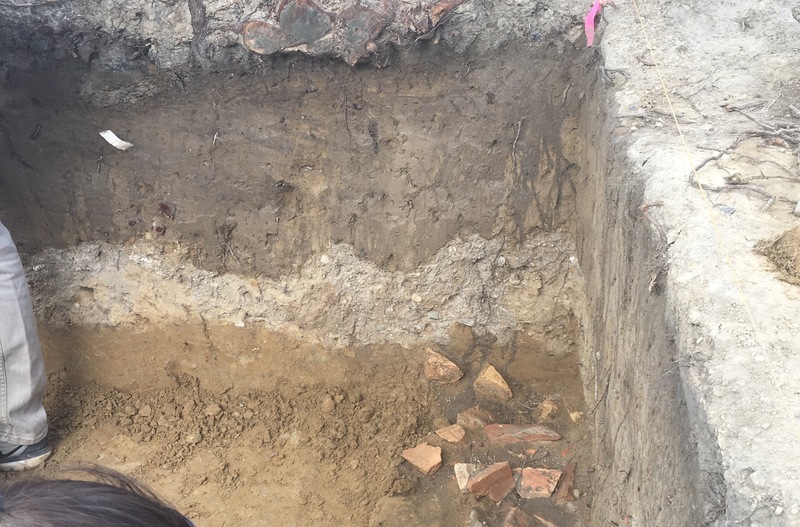 This unit also had several large artifacts, including a metal bucket and a coal shovel. Unit F – large stones, in situ shovel. 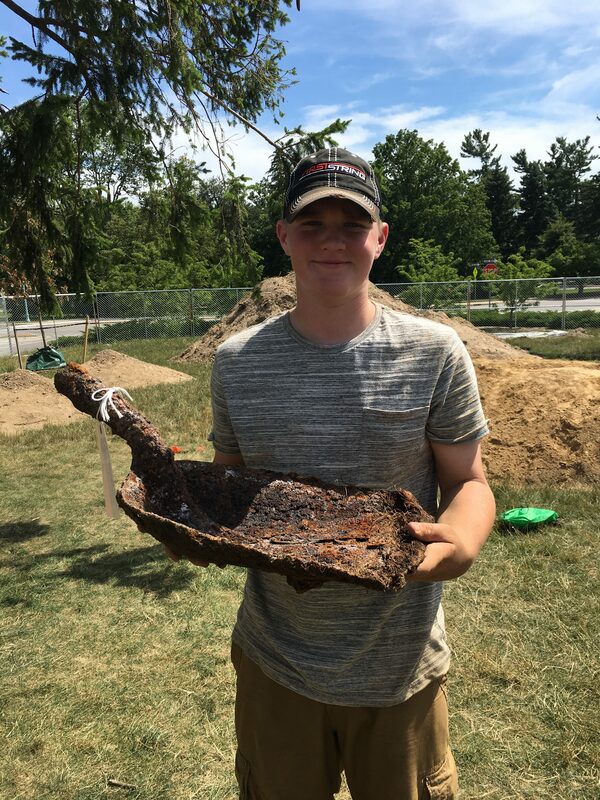 High school volunteer Spencer W holds the shovel from Unit F.
The artifact cleaning, sorting, cataloging and report writing had just begun. Stay turned for more posts this fall about things learned from the field school.